The dissonance between Obama and Wheeler has the makings of a major policy fight affecting multibillion-dollar industries. The president wants clear rules to prevent Internet service providers from auctioning the fastest speeds to the highest bidders, a scenario that could favor rich Web firms over start-ups. Wheeler, a former lobbyist for the cable and telecommunications industry, has floated proposals that aim to limit the ability of service providers to charge Web companies, such as Netflix or Google, to reach their customers. But critics have argued that his approach would give the providers too much leeway to favor some services over others. In a new survey, the University of Delaware’s Center for Political Communication found that support for neutrality is strong and widespread — regardless of gender, age, race and level of education. 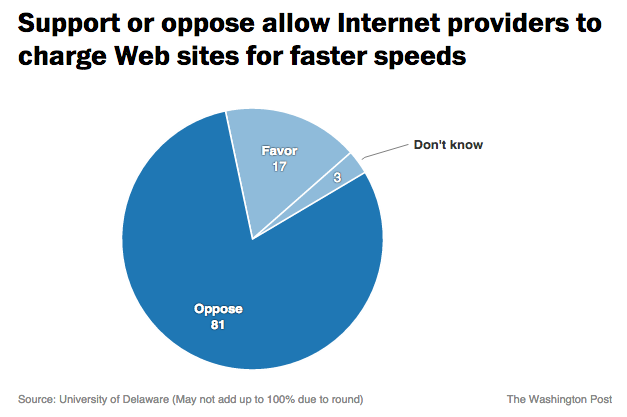 About 81 percent of Americans oppose allowing Internet providers like Comcast and Verizon to charge Web sites and services more if they want to reach customers more quickly, that is, allowing what are often called “Internet fast lanes.” Most surprising of all, given comments by Republican lawmakers over the past couple of days, is that support for net neutrality is bipartisan. Indeed, Republicans were slightly more likely to support net neutrality than Democrats. Eighty-one percent of Democrats and 85 percent of Republicans in the survey said they opposed fast lanes. The poll’s margin of error was 3.2 percentage points. In a blog post titled “Surprise! We agree with the president’s principles on net neutrality: Reiterating our strong support for the open internet,” Comcast exec David Cohen notes that the company practices Obama’s proposed rules against blocking, throttling, paid prioritization, and that it supports increased telecom industry transparency. On the first three, he’s technically right, at the moment. On the last one, he’s dead wrong. It’s true that Comcast practices those three principles of net neutrality— because it is legally obligated to under the terms of its last mega merger, the deal in which it acquired NBC. … Meanwhile, before the NBC merger, Comcast actively lobbied against net neutrality. In the past, it violated [since overturned] FCC rules on net neutrality by throttling customers. It has helped put into place anti municipal broadband laws all throughout the country with the help of organizations like ALEC and the National Cable & Telecommunications Association. It has run fear mongering campaigns about municipal broadband competitors. Messaging and self-driving car apps and health records will reside on your phone, along with the videos of panda cubs wrestling with zoo keepers. And you won’t be able to live without any of it. When that realization hits, it should follow that the Internet service providers –companies such as Comcast and Time Warner Cable now, and likely a company like Google in the future — will be regulated like utilities. They should be held to a different standard if they provide services that are essential to daily life. Water prices, for example, stay within certain bounds so that wild market swings don’t force swaths of the population to live without the ability to bathe, drink and cook. Remember the debacle of the Enron energy traders and the California power crisis and unnecessary brownouts? Regulating services as utilities is designed, in part, to keep things like that from happening. If the government leaves the Internet alone — letting broadband and content providers hatch whatever devilish plots they feel are in their interest — some startup, or a few of them, will inevitably come up with the next idea that will be far outside the current debate. It might involve advances in compression technology, making all talk of fast and slow lanes irrelevant because they could suddenly allow the existing infrastructure to carry more traffic, or breakthroughs in mesh networking, which might allow people to get broadband connections without using much of that infrastructure. Whatever the game-changing innovation might be, both sides in the current dispute would be forced to deal with it, pitching in with incremental innovations.